EBF3: final new features list! 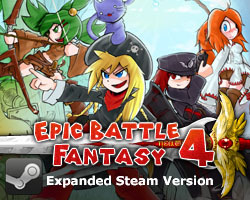 Hey guys, I thought I’d make a detailed list of the changes in the Steam version of EBF3. • There’s a new options menu which includes sound, game speed, fullscreen, and window size/resolution. • The new resolutions are a bit higher than the original one, but they’re not quite HD. • Game speed let’s you play at double speed if your computer is fast enough – useful for backtracking or grinding. • There’s also a “Frameskip” setting for slow computers – this will always run the game at normal speed, and skip a lot of frames if it has to. • There’s a foe wave counter in battle now! • Scanned foes’ information can now be viewed at any time during your turn – like in EBF4. • Text pops up when a status effect is inflicted – like in EBF4. • There’s more useful tips scattered around the menus and tutorial. • Jpgs and music are uncompressed now, and the battle backgrounds have a higher resolution – so some things should look a bit better. • There’s no ads or links during gameplay. • Tiny interface improvements here and there. • Lance’s general defence buffed by 10% – he died too much and I don’t think this was intentional. 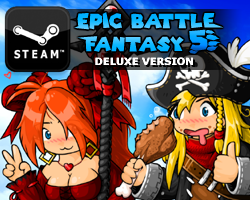 • The links and credits on the main menu and ending and have been updated – EBF3 is just a big ad for EBF4! • The old graphics quality option is gone, because Adobe are stupid – I’ll add this back later if they make it possible. • The game is Windows only for now – but I’m considering Mac support (and for my other games too). I’ll just need to get a Mac first, and I really don’t want one. This entry was posted in Epic Battle Fantasy 3 on August 31, 2016 by Matt Roszak. Awh sweet! the minor improvements that EBF4 had over EBF3 (text when debuff, being able to inspect enemies at any time) have now made the two games equally amazing IMO. Actually, in some of these zones, you can even not fight foes in the first time (for example, in the desert zone you can walk around two out of three encounters). I don’t think it’s really a bug though, since they dont matter that much, and if you fled the first time, you can come back later (you will propably need this exp anyway). If they were important, they would be blocked like godcat in EBF4. Isn’t that scanned foe’s information can always be viewed during battle in EBF 3? I remember that I used to enter a battle to scan a foe, and retreat and enter the battle again to recover Lance’s turn. And scanned foe always wear a “?” mark which I can point at to see his stat. Oh I’m sorry, I have just checked again and notice that the scanned stat can only be viewed when I am about to issue an attack/skill. Don’t worry, i thought the same thing at first time. Great! Im completing this 100% this time. Downloading this at midnight in five hours.